Four ex-U.S. Attorney’s won Republican primary bids Tuesday for public office. But perhaps in the most interesting race, a fifth ex-U.S. Attorney, Republican Mary Beth Buchanan — a controversial figure during her reign as the top Pittsburgh prosecutor — got trounced in a contentious battle for the 4th Congressional District seat. 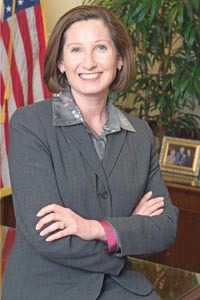 Buchanan blamed her defeat on the anti-incumbent sentiment in the nation, even though she was not an elected official, the Post-Gazette reported. She was appointed by President Bush and stayed on for a while under the Obama administration. She got about a third of the votes. Elsehwere around the country, according to the website Main Justice, which closely tracks U.S. Attorneys, former Arkansas U.S. Attorney Tim Griffin won the Republican primary for the 2nd Congressional District in Arkansas. Three former Pennsylvania U.S. Attorneys won their contests in that state, according to Main Justice. Pennsylania Attorney General Tom Corbett, a former U.S. Attorney, won the Republican bid for Pennsylvania governor; Pat Meehan was unopposed in the Republican primary for a Congressional seat held by Democratic Congressman Joe Sestak, who defeated Sen. Arlen Specter in the primary; and Tom Marino won his bid in the Republican primary for a Congressional seat. Posted: 5/19/10 at 11:28 AM under News Story.